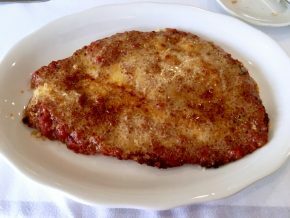 This is chicken parmesan perfection. Once upon a time my wife had the best Caesar salad in Little Italy and wanted to relive that moment. Instead of going on a wild goose chase, I decided to help her out by searching the interwebs for the best Caesar in New York. This led us to Pietro’s, an institution that has been around forever and looked like a great place to conduct mob business. It was strangely completely empty at 3:00 in the afternoon on a Monday, but it seemed like more of a dinner spot anyway. When people talk about traditional New York bagels, odds are Ess-a-Bagel is at the top of the list. Operating since back on 1976, the lines are long, the wait staff is rude and the cream cheese flavors are copious. In other words, it’s very New York. 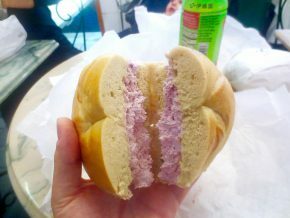 I popped into the Midtown location and snagged myself a salt bagel with blueberry cream cheese. Sometimes when you’re traveling you just have to eat in. When you do, you should hope you’re staying somewhere like Le Parker Meridien in Midtown New York. Because if you do, you’ll be lucky enough to have Burger Joint downstairs. 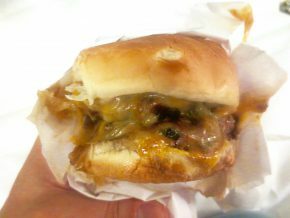 Burger Joint isn’t just some typical hotel restaurant, it’s a no-frills spot with a small menu consisting of only burgers, fries, and a pickle with prices that are pretty typical for New York. 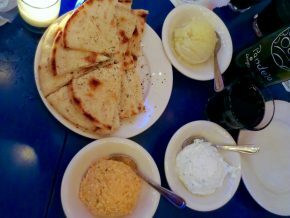 As a man from the Detroit area, I was pretty spoiled by Greek food growing up. Thus, I am pretty skeptical when I encounter the stuff anywhere else, especially in Midtown Manhattan, which is not exactly known for good food. Nonetheless, my brother-in-law recommended stopping in to Souvlaki GR and I joined to find essentially the smallest Greek restaurant in history with enough charm to get my hopes up.